At Sony’s pre-TGS press conference, Kaz Hirai announced that rumble is coming back to the PS3 in a big way, in the form of the new DualShock 3 controller. 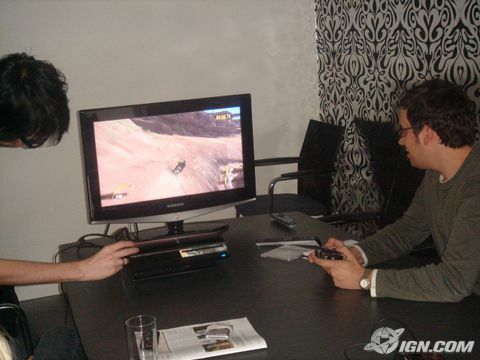 Gamers have been clamoring for force feedback ever since Sony first unveiled the PS3’s Sixaxis controller sans rumble. We just couldn’t properly enjoy shooting aliens without the little vibration telling us that we were shooting aliens. At any rate, Sony heard the call and is making amends. “We have not made any changes to its outward appearance and design, but it does have vibration,” Hirai said. And fear not, motion control fans…the waggle feature isn’t going anywhere. The wizards at Sony have found a way to include both features. Which brings us to the catch: the DualShock 3 will be available this year, but only in Japan. Everyone else will have to wait until next Spring. A PlayStation 3 and PSP owner has discovered that Liar is playable via the PS3’s Remote Play feature on the PSP. This is the first time a Blu-Ray based game is able to take advantage of the feature and is reportedly quite responsive and playable. It has even been suggested that in light of all the flak Lair has taken over its Sixaxis controls, the use of the PSP’s analog stick is actually preferable. What’s most curious about the revelation is that it is a revelation at all. This sounds like something Sony would have jumped all over, especially once the disappointing reviews started pouring in. New videos for the upcoming PS3 game Folklore show some interesting footage of the game’s combat including some idea of how the epic boss fights will unfold. The game has a remarkable style and art direction that is visible here especially in the brief pre-combat cinematics. Folklore looks a little like Kameo crossed with Fable and Pokemon as players control one of two characters who use the game’s “folks” as summoned creatures to do the grunt work of fighting foes. A follow-up to Genji, developers Game Republic are promising better Sixaxis controls and an online mode. Folklore is scheduled for a North American release on October 12. Destructoid is among the first sites to notice that a major retailer, Target in this case, is starting to setup their PS3 demo units. If you’re lucky, the Target in your area has a PS3 demo station just waiting to be played. Destructoid noticed some issues though - specifically that the locked down controllers made it harder to test out the functionality of Sony’s SIXAXIS. Also, you won’t be able to put your grimy little mits all over the console itself - it should be interesting to see how pretty the console looks with fingerprints all over its shiny face. Still, this might be your first chance to check out the shiny new graphics made possible by the Cell processor and compare it to the Xbox 360. Sony has dropped a new television ad, this time hyping up their tilt-sensitive SIXAXIS controller. Again, the advertisements use abstract imagery to promote the system, using rolling eggs to illustrate the control enhancements that motion-sensitivity will offer. While Sony’s campaign has done little to give consumers any specific game information, the commercials so far act almost entirely on an emotional level. IGN PS3 may be impressed with the PS3’s appearance and performance, but that doesn’t mean they like everything about the console. This week, in between 1) bragging about how they actually got to touch a real live PS3 and 2) putting the wireless controller through the ultimate stress test, they actually sat down and played some games on the machine. While I’ve never found the PS2’s Dual-Shock controller particularly comfortable, IGN had even harsher words for the newly-renamed SIXAXIS. Among their complaints - light weight, plasticky feel, and hard-to-use shoulder buttons. Could it be because, say, the controller was quickly and shoddily designed to mimic some of the Wii’s functionality?? Only Sony execs will ever know… Anyways, see IGN’s full thoughts after the jump. Oh Kaz, will your quotes ever cease to amaze? This week, Kaz Hirai of Sony talks to Kikizo about a combo motion-sensing / rumble remote, and while he says it’s “possible”, he says it would just make those PS3 controllers (which are currently going to cost you $39.99) too darn expensive. That’s quite the choice quote, given that Nintendo has managed to offer the package Kaz is talking about, a wireless controller with motion sensing and rumble (need we mention the speaker too? ), for the very same price of $39.99. And Nintendo is notorious for not taking losses on their on hardware! Sony Computer Entertainment of Japan announced today the pricing and availability of some of the accessories for the PS3 in that territory. On launch day, November 11th, gamers will be able to purchase additional wireless SIXAXIS controllers for 5000 Yen, roughly $42 US. Gamers looking to play their old Playstation 2 games on their new console will also want to pick up a memory card adapter, listed at 1500 Yen ($13 US), also available on launch day. The memory card adapter is a USB device that allows users to copy their PS1 and PS2 saves to the internal hard drive of the Playstation 3. Finally, the BD-ROM remote will ship on December 7th, for 3600 Yen ($31 US). Since the PS3 controllers are wireless, there is less of a pressing demand for a fully functioning BD-ROM remote, but it would have been nice to see the device on launch day. Rumor: PS3 Controller Named Sixaxis? Since Sony has removed the rumble from their Playstation 3 controller, the “Dual Shock” moniker no longer applies. 1up did some digging through some trademark filings, and found an unusual one coming from Sony Computer Entertainment Japan. A request for the word “SIXAXIS” was made, and while the descriptors of the usage of the trademark seem incredibly varied, the new design of the controller and the “six-axis” motion sensitivity would seem to make this a good fit. 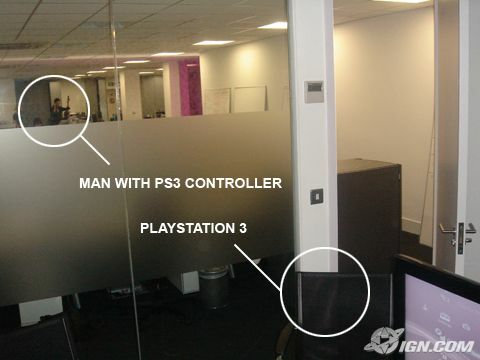 Gallery: Rumor: PS3 Controller Named Sixaxis?